GT3076R-HTA with TiAL turbine housing. 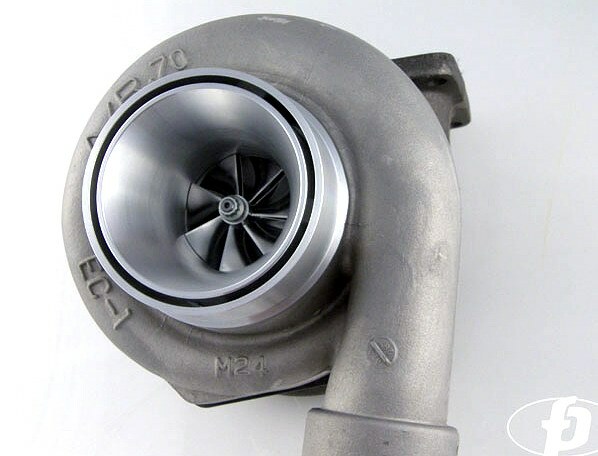 One of the most popular of the Garrett Ballistic Concepts Turbochargers has been the GT3076R. This mid-sized roughly 52 lb/min flow rate turbo is widely used in 2.0 - 2.7 litre applications seeking a 400-500whp output level with minimal turbo lag. The only thing that could make this turbo any better would be a better compressor wheel that delivers decreased spool time and increased max output, and we have just that, the HTA wheel aero. Scaled down to 76mm exducer and 54.8mm inducer this aero flows over 57lb/min without dropping efficiency, and works well to sustain boost pressures above 40psi is needed without compromise.